Beach Photography Tips For Beginners.What Lens and Camera Setting to.. 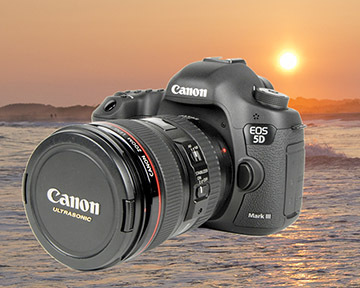 This article on beach photography tips will help you improve all of the beach photos you take. You can use these ideas for taking amazing seascapes and photos of people on the beach with the photography equipment you already have. Part I gives you the advice on the gear you use and specific tips that will dramatically improve your creativity with your photography. Part II will give you tips on portrait photography on the beach. Let's face it, finding out how to take great beach photos begins with equipment. Let's dive in with what photography gear is needed and what camera settings are best. what's the best camera for beach photography? This sounds like a sassy answer, but it's really true: the best camera for beach photos is the one you take with you. You need to take it with you-and maybe with an accessory or two-and use it. With that said, an advanced point and shoot, a DSLR, or one of the newer mirrorless cameras are all great choices to capture the spectacular natural beauty of the ocean. Reading this article will put you in the right frame of mind to use any camera. Although you can take some nice beach photos with your cell phone, use your camera that has the ability to set different settings. We'll get to why in just a minute. Which lens for beach photography is best? 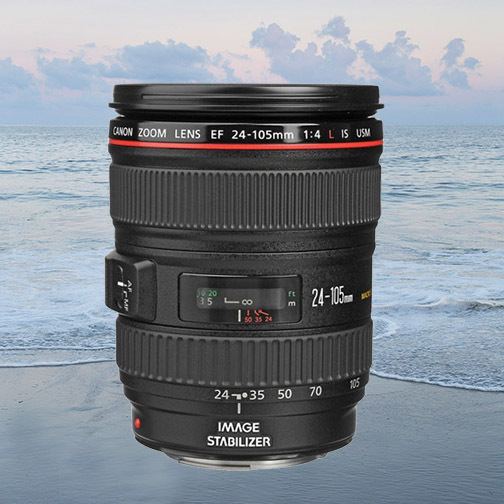 What's the best lens for beach photography? Ideally, it's better to use your camera with a nice zoom lens attached. The beach and its surroundings will provide you with a nice variety of shooting opportunities, zoomed out for wide views and zoomed in for photography of more distant subjects. 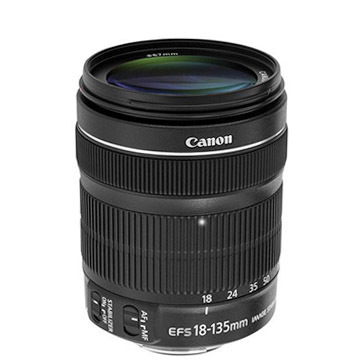 The basic kit lenses that come with DSLRs come up a little short in that department. A 3x zoom range is functional, but you're very limited at both very wide settings and zoomed in telephoto settings with one of these lenses. A lens that can zoom in far will give you a chance to get some great shots of wildlife, the ocean waves, a distant boat, or yes, even people. On the flipside of that, if your lens can also go wide you can get some strong perspective photos too. 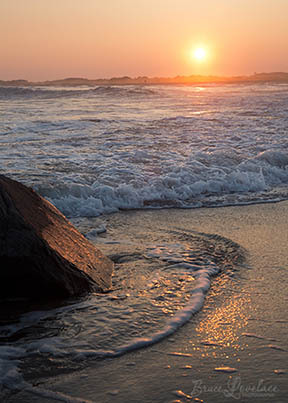 During daytime hours at the beach you have plenty of daylight, so your automatic or program settings will do fine to give you sharp, clear photos. When it's bright like this, your camera will choose a fast shutter speed and a small lens opening, which fill keep things in focus with a deep depth of field. It's the special situations that cause the frustration when we see a photo opportunity, but our camera comes up short in getting the settings right for the effect we want. 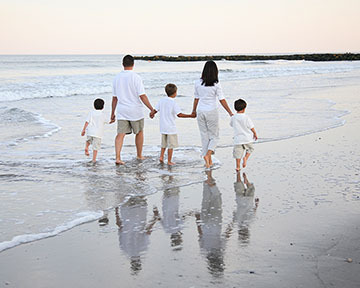 Here are a few special camera settings for beach photos. Here are some camera setting for those beach shots that are a little more challenging and and will give you more control over the success of your photo. 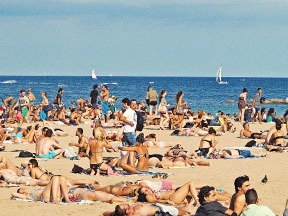 Some situations "fool" your camera into underexposing your beach photos. ACTION SHOTS. Your photographing the kids playing soccer on the beach and it's not a bright sunny situation. You need a fast shutter speed to make them sharp. Set your camera on shutter priority and you choose a fast shutter speed to freeze the action. DIM LIGHTING. It's a dark cloudy day or the sun set 20 minutes ago and you see a photo you want to get. You need to set your camera to a high ISO setting, so that it doesn't need as much light for a sharp photo without blur from movement. ISOLATE YOUR SUBJECT. You want your subject to be sharply focused but the want the background to be blurry. 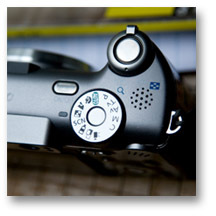 You need to set your camera to use a wide open aperture to get a short depth of field. That way your subject is in focus but the background is blurry. UNDEREXPOSURE. Sometimes your camera meter gets fooled on the AUTO exposure setting. It's not unusual that beach photos come a little dark. 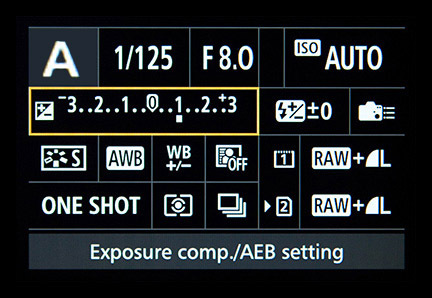 Use an EXPOSURE COMPENSATION setting and add an f/stop (double the exposure). Pay attention to color and use it to your advantage. Sometimes very simple compositions are still very dramatic with the use of contrasting colors. The other thing that makes this a well composed photo is the position of the tropical drink. 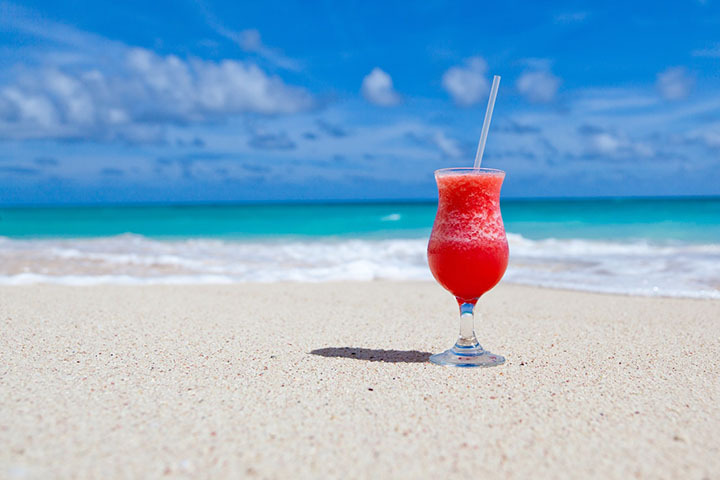 Although it's off center, the image is still balanced because of the drink's shadow on the sand. If the sun is behind your subject use your camera's flash to fill in the shadows. Try one with and one without flash. Keep the horizon level. It's distracting if it is tilted to either direction. Shoot just before sunrise or just after sunset during what photographers call "The Golden Hour." The lighting is often spectacular. Use a polarizing filter to enhance the colors and darken a blue sky. Use a UV filter to protect your lens from sand and saltwater. Here are 5 ideas for taking your creativity to a new level. Use them to spur your own imagination and come up with your own variation of one or more of them. The possibilities are endless. Digital photography gives you an opportunity to play around and try many variations and select the one or two you like the most. Have fun with this! 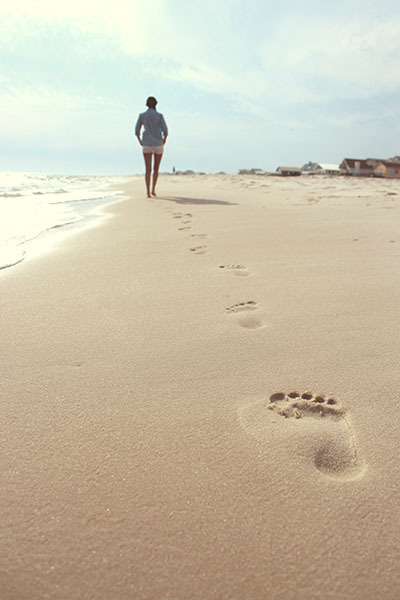 Make footprints in the sand and photograph them. You can do this as they disappear into the water. 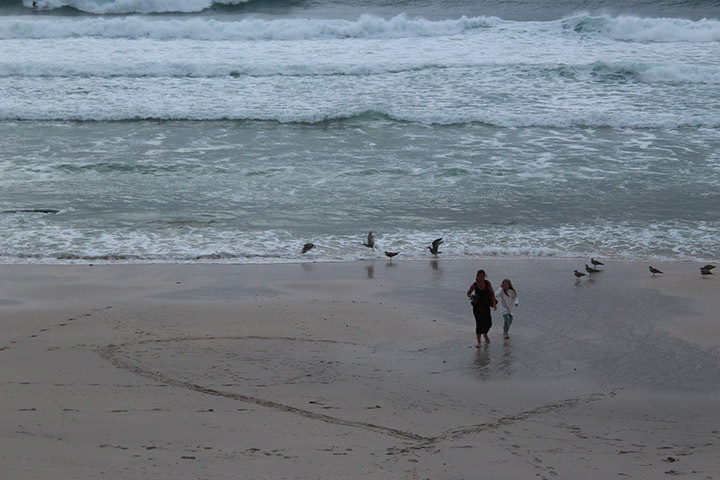 Have your beach photo tell a story. Look for interesting shadows to photograph. The shadows will be long and skinny early and late in the day. This was a selfie I took for another post I was writing. 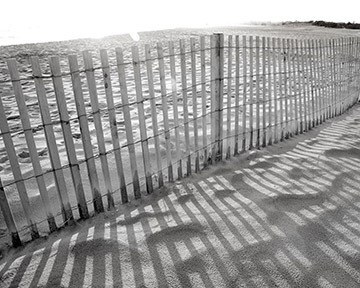 Try converting some of your photos to black and white to inspire your creativity. Shadows and abstracts are often the most interesting subjects to shoot. 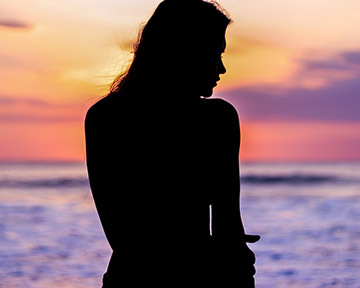 Sunrise and Sunset are the time you want to try a few silhouette photos. You may have to use your camera's exposure compensation setting and underexpose your photo on purpose. When the tide is going out, look for a flat area of the beach to try a few reflection photographs. 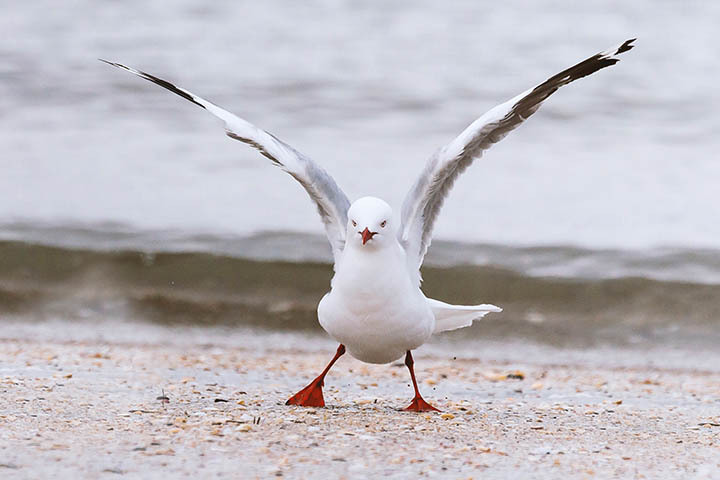 People and wildlife work well for subjects for this kind of beach photography. This second part of the post covering beach photography tips focuses on photographing people on the beach. 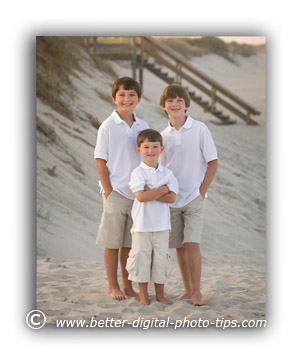 Here are 5 tips specifically are to give you advice on taking beach portraits. The best time to photograph people on the beach is late in the day. You'll be able to get some stunning shots right around sunset. You could try sunrise too, but usually it takes a few hours for people to be wide awake and looking their best. The light at or just after sunset is not as bright and your subjects are less likely to be squinting. You do have to work quickly though, as the amount of light at that time fades quickly. The color tone of the light is much warmer and the quality of the light is much softer early and late in the day.. In this photo of these three brothers, the sun was partially below the horizon and partially diffused by thin clouds. you can see the sunlight is coming from the left at a strong angle, but it's not creating harsh shadows because it's diffused. If it's not quite sunset and the sky is very clear, the direct sun may still be too strong and cause squinting and harsh shadows. If this is the case I'll look for shade. I try to look for areas where the sand dunes are high and block the sun. That provides open shade. Another idea is that can do beach photography in the shadow of tall waterfront hotels or underneath piers if you can find a suitable angle to get a good background. Using a long focal length on your camera's zoom creates a more flattering look for portraits of people. Zoom in as much as you can and then distance yourself from your subject so that they fill most of your camera's viewfinder. This is one of the secrets to making people look their best in portrait photography. This farther distance away from you, the photographer, also allow people to relax and it will include less clutter in the background becaue of the narrower angle of view. It's easy to focus on your subject and neglect to check the background before you trip the shutter. We've all made that mistake. Position your camera in just the right spot so that the background compliments your subject and doesn't distract. 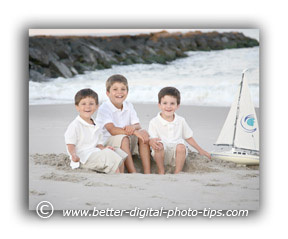 In the photo of the three boys and the sailboat, I quickly dug a hole in the sand in just the right spot. The light was fading quickly, so I had to work fast. I adjusted my camera height on my tripod so that the rock jetty behind my subjects acts as a framing device. The sun was already below the horizon, so the light was very soft. Look back at the first beach portrait of the 3 boys in front of the steps. I moved my tripod to have the boardwalk and steps in just the right spot in the background. What to wear for beach photography? 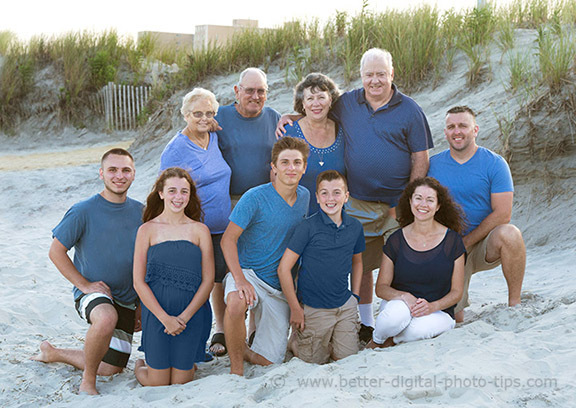 This clothing tip applies to all kinds of portraits, not just beach photography. Keep everybody in solid colors. Stripes and patterns are distracting and the emphasis should be on your subjects' faces. All solids-no stripes, plaids or busy designs. Stay away from bright colors for beach posing. Neutral colors and pastels work great with the lighter subdued colors of the ocean sand. 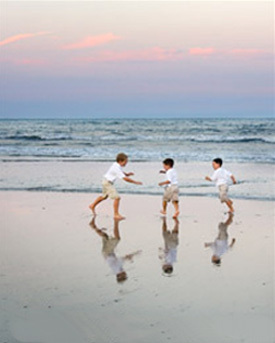 One of the most favorite clothing choice for pictures on the beach is khaki and white or denim and white for good reasons. For more on clothing tips go to portrait clothing. This is beach portrait tip #5. Try to find a beach that isn't full of people. Other people have just as much right as you do to enjoy the sun and sand, but crowded beaches make it hard to shoot while keeping others from entering your composition in the background. Finding a beach off the beaten track may be a challenge. It will be helpful to scout out locations beforehand at the same time of day that you'll be shooting. Usually staying away from the boardwalk and business areas is a safe bet. Don't forget to take the candid photos too. In this reflections beach photo, I took advantage of my DSLR and its 5 frames per second continuous speed shutter setting. We were done shooting our posed portraits. The boys were running around and having a blast. This would have cost me a fortune in film processing and proofing in the days of film. I shot over 80 frames in just a few minutes. I set my ISO setting very high to allow me to use a high shutter speed in the fading light. Look at that beautiful sky and the reflections in the sand! PHOTO EXPOSURE. 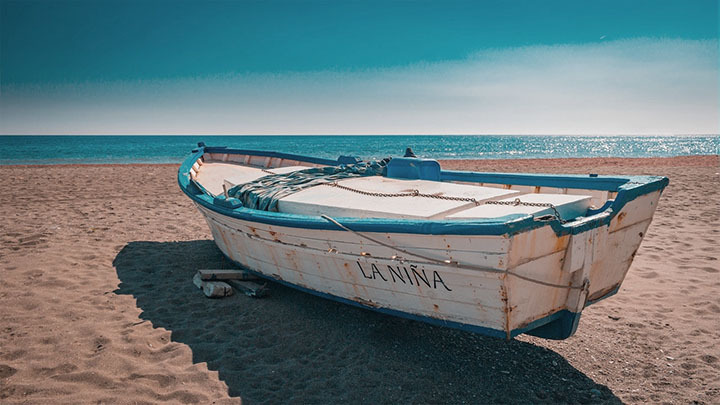 If you don't have a "beach" setting on your camera, you may have to adjust your settings to overexpose a little from the auto exposure your camera uses. The overall light colored sand and sky can fool your camera and beach photos sometimes come out a little darker than they should. BLURRY PICTURES. This is another challenge for newbie photographers. Knowing how to set your camera's shutter speed will help you avoid taking blurry pictures while doing your portrait photography. Here is more on shutter speeds. p.s. 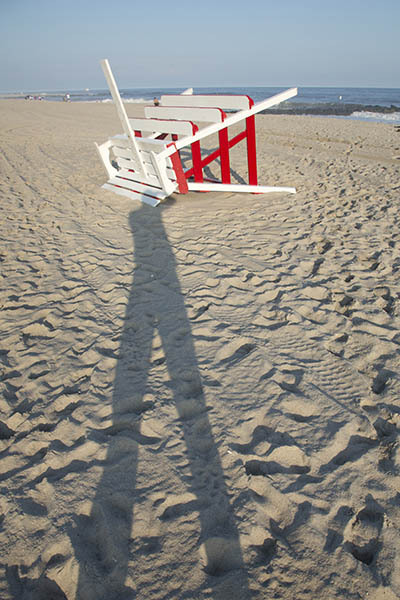 You can apply these beginning beach photography tips in the winter time too, when no one is around to bother you.